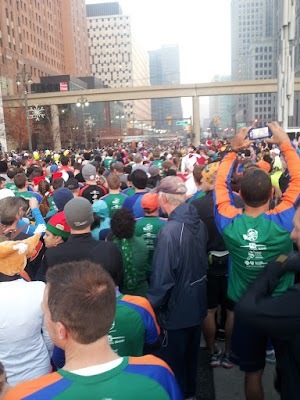 This was my third year doing this trot. It always has its pros and cons, but this year, the cons seemed to outweigh the the pros. I was really excited to hear and read that so many people were going to do it this year. 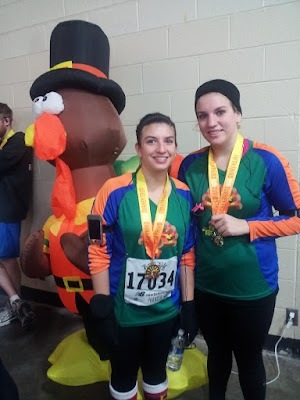 Two of them being my two sisters, whom neither had ever ran a 5k before. The four of us (Em, too) headed down about an hour before race time. It took longer than normal to find parking, which wasn’t a good sign. When we got down near the start, you could tell it was going to be crowded. I got to my corral and could barely see the start banner. That boxer guy? You forgot his name? I bet you didn’t forget who the Red Wings hockey arena is named after, which is insane because it just so happens to be that same boxer guy, Joe Louis!! Anyways back to waiting for the race to start… The announcer dragged on forever and didn’t start the first wave until 8 minutes later. Not that big of deal. What was though was the fact that the waves that were to start 15 minutes later, started at the same time. This course is not big enough for 20k+ runners all so close to each other. Almost all turns slowed to a walk. It was almost impossible to pass people. I couldn’t wait to get pass the 5k/10k split. It finally opened up, but was still more crowded than I expected. This was my 3rd run since the marathon, so I wasn’t hoping for some miracle. I expected to feel tired and I was. I was happy to see the 5 mile marker and picked up my pace a bit. Sorry about the finger. 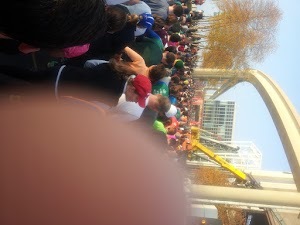 That would be me and about 200 others at a complete standstill, waiting to cross the finish line. Good thing I wasn’t going for a PR. The organizers really need to rethink how they do this race next year. They are going to lose a ton of participants for next year, which I wouldn’t mind. They clearly don’t know how to handle a race of this capacity. All was not a loss. My sisters seemed to have a good time. I had a good time, too. I just hope next year’s is revamped. I don’t want to stop a tradition.